Israeli police officers stand watch outside Damascus Gate in Old City on Dec. 7, 2017, in Jerusalem, Israel. JERUSALEM (CNN) - Disillusioned and disappointed Palestinians took to the streets in the West Bank, Gaza and Jerusalem on Thursday following US President Donald Trump's decision to recognize Jerusalem as the capital of Israel. Some were angry, others resigned, saying a peace process appeared all but impossible. Dozens gathered outside the Damascus Gate, in the eastern part of the city. "We are Jerusalemites, we belong to Jerusalem," they chanted. Jerusalem is "my life," said Nawal Sahtay, 45, who grew up in Jerusalem. "For Trump to come just like that and to say, Jerusalem is not yours anymore ... this means he is taking everything from me." She said she's expecting more measures to be put in place by the Israeli government that will make life harder for Palestinians in the city. "We are hardly able to live in Jerusalem without it being declared the capital of Israel. What about now?" "A third intifada is knocking on the door," she added. George Assad, 43, a Christian Palestinian who was also at Damascus Gate on Thursday, believes Trump's announcement exposes the true face of American policy over the last 25 years. "The fig leaf is off," he said. "This only shows that the Americans' position hasn't been [as] an honest broker, as they claim. And this is the final nail in the coffin of the peace process, of the two-state solution." He doesn't believe that Trump will continue to work for that solution, as the President pledged in his speech. "The position of Trump is basically an Israeli position," he said. "The Israelis have continuously said they want to pursue peace ... but on the ground, nothing happens." Protesters had also been gathering since early Thursday morning in al-Manara square in central Ramallah, chanting and calling for an uprising. Rania, a 48-year-old Palestinian, came with a group of women to join the protest. "We should cancel all agreements, Oslo in particular," she told CNN. "No more relations with Israel, and a third intifada should start ... to the Arab leaders I say shame on you, you sold us." The Oslo Accords, which created the Palestinian Authority, granting it self-governance over parts of the West Bank and Gaza, were signed by Israeli and Palestinian leaders in 1993. The agreement included the aim of achieving a final status peace agreement within five years, but implementation and subsequent negotiations foundered. Naim Masarweh, an elderly Palestinian man, was angry too. Unable to speak because of a medical condition, he had come armed with a pen and paper, determined to spread his message however he could. "What Trump declared is worse than what Balfour did and is more dangerous than Nakba," he wrote. The Balfour Declaration, made in 1917, was a letter from the British government expressing support for the "establishment in Palestine of a national home for the Jewish people." The "Nakba" -- the Arabic word for "catastrophe" -- is the term given to the displacement of hundreds of thousands of Arabs from their homes -- some expelled, some fleeing -- in the period surrounding the creation of the state of Israel in 1948. Hana Dreidi, 50, had come to the square with her sister and her sister's children. "We are Palestinian-Americans," she said. "We don't see Jerusalem as anything but Palestine." She believes that Israelis also have rights in the city and hopes for a two-state solution, but she is frustrated by Trump's announcement and thinks it will only lead to violence in the region. "We know our rights and we know Jerusalem is our right. He won't take it away with some words that he announced," she said. In other parts of the West Bank, tensions were running high. 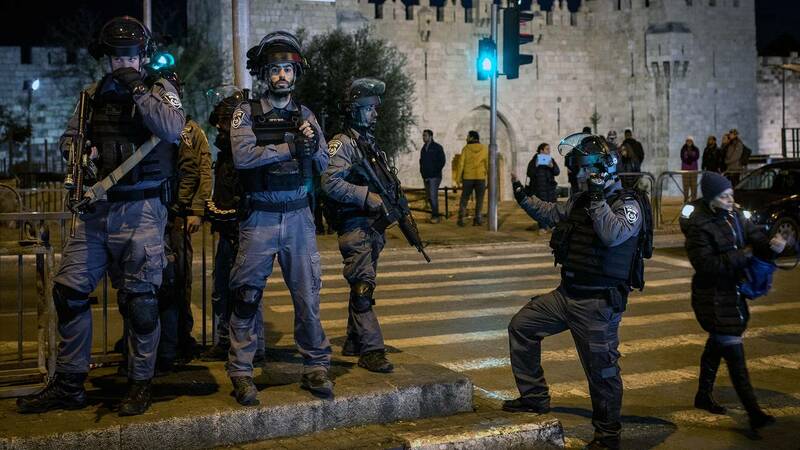 Palestinians in Bethlehem and on the outskirts of Ramallah clashed with Israeli soldiers, who used water cannon and rubber bullets on the protesters. According to the Palestinian Red Crescent, at least 49 people were wounded in clashes on Thursday in the West Bank, with most of the injuries from tear gas and rubber bullets. Protests in Gaza began on Wednesday and continued on Thursday, with some demonstrators burning American flags and images of Trump. Among Palestinian refugees in Lebanon, feelings were muted. At Beirut's Shatila refugee camp, home to thousands of Palestinian refugees, the location of the American embassy in Israel is likely to have little impact on the daily lives of the people here. Most of them have never stepped foot in the Palestinian territories. Abdullah Talib, 92, does feel angry, but his anger is focused on Arab leaders, who he says profess support for the Palestinians' claim to Jerusalem, then do nothing. Ahmad Hadid, 77, has a little more hope that he could one day live in a Palestinian Jerusalem. "Until judgment day I will wait," he said. "I will tell my children and my grandchildren, our land is Palestine."